I can't say enough about Joe Abercrombie's storytelling skills. I love how his characters struggle with their flaws, fighting--but usually failing--to overcome their inherent weaknesses. 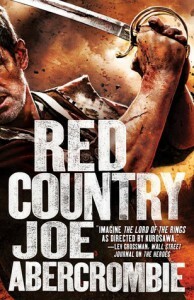 Red Country reminds me a bit of an Elmore Leonard western, with an enigmatic troupe trudging through the wilderness in search of their elusive goals. Red County also features a satisfying return of a favorite Abercrombie character, although I won't spoil it with any hints, this book is as gripping as any. Action-packed, witty, sarcastic, relevant, poignant, and fun, Red Country is fantastic.